In the future, everyone will get Blue Apron ad copy. 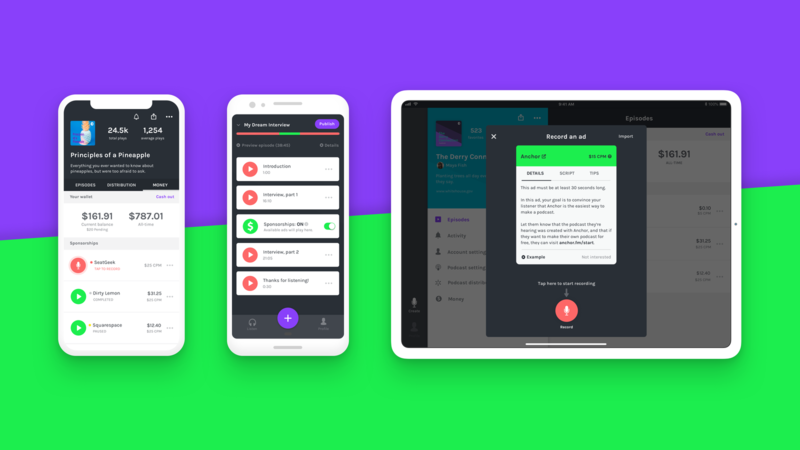 Meantime, Anchor’s helping users monetize their shows with Sponsorships, a new program designed to match podcasters with advertisers. The feature is pretty straightforward for anyone who’s ever attempted to make some money podcasting, but now it’s integrated into the site’s overall mission of democratizing the podcasting process. Hosts can import a pre-recorded ad into the show or do their own reads, determining where in the episode to place it. In my experience, advertisers love a good mid-roll ad, though I’ve always balked at breaking up the flow of things mid-conversation. The system can also ad advertising spots retroactively to older episodes. Anchor’s got a bunch of advertisers on board — many of which will prove familiar to those who’ve spent any time listening to podcasts. The list so far includes SeatGeek, Cash App, Ro, Dirty Lemon, Baboon, Living Proof, The Citizenry and, of course, Squarespace. Money will be deposited into an account, which can be withdrawn via Stripe. Both stripe and Anchor will get a small cut of the transaction.